Money Trouble in North Dakota? Summary of North Dakota Usury Law(s) / Quote: "Legal: 6% / Contract: North Dakota contract rate is 5.5% over the average rate for 6-month U.S. Treasury bills but not less than 7%. / Judgment: 12% / Corporate: Any rate"
Legal Maximum Interest Rates: Quote: "6% (§47-14-05); if contract in writing, up to 5.5% higher than average interest on treasury bills, but maximum must be at least 7% (§47-14-09)"
Usury Penalties: Quote: "Forfeit all interest and 25% of principal (§47-14-10); Class B misdemeanor (§47-14-11); if interest paid, twice amount paid may be recovered (§47-14-10)"
Judgment Interest Rates: Quote: "Contract rate, otherwise 12% (§28-20-34)"
Legal Exceptions: Quote: "Loans to corporations; agency funded by state/federal government; amount over $35,000; loans to partnerships/limited partnerships (§47-14-09)"
Between losing his job, not paying bills on time and spending too much money Gaston needs a bad credit loan as quickly as possible. He owes a total of $5500 to credit cards, pay day loan lenders and taxes on money he earned before he lost his job. He was not paying taxes on his self employed earnings or at least not enough. Now he owes a couple thousand to the IRS and no way to pay it at the moment unless he wants to forego paying his mortgage and car loan. He is working again, and he is paying his mortgage etc. but does not make enough to repay everything right away. He needs a loan to help him through the time he needs to earn the money to pay off all of his debts. When he was unemployed after he lost his business, he had to charge many of his regular expenses to his credit cards. He owes several thousand on his credit cards as well. The interest rate on the credit cards will be 21% which is quite high. His last resort before he started working again was to take out a pay day loan. He started working and based on what he was to be paid was able to get a loan which he was to pay back with his first pay check. He paid most of it back, but he also needed groceries for the family and he needed to pay utilities otherwise they were going to turn off the water and the electricity. Of course there were lots of late fees and high interest fees with the pay day loan because he did not pay it off in full as originally agreed. He desperately wants to be approved for bad credit loan of $5500 with a three year term on the loan. Gaston is like many consumers who lose their jobs. They may not have any emergency savings to rely on while they find the next job. When you live pay check to pay check, it is tough to pay the bills when there is no money coming in. As soon as they stop paying the bills their credit rating takes a hit. They suddenly have a bad credit score and owe money to various groups, whether it is government taxation, credit cards or high risk lenders such as pay day loan lenders. When this occurs it can be tough to be approved for any loan at a reasonable interest rate. Gaston should be approved for the loan he has applied for. With his new job he can afford to pay the loan payment each month plus his regular utility bills and mortgage payments. He also plans to begin saving some money for the next emergency that may come along to test Gaston’s ability to pay all his regular monthly payments. It may take him up to seven years to clear his bad credit record. If you live in the State of North Dakota and you're struggling to get a loan approval with a bad credit rating we hope our website helps you in some way. 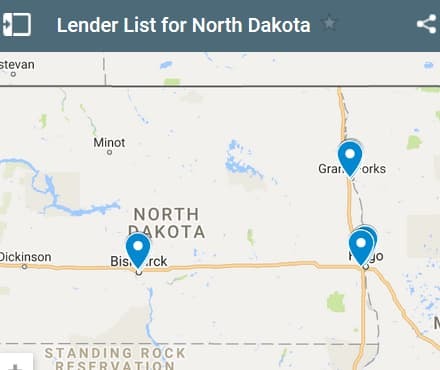 Last 5 debt service loans approved in the State of North Dakota. Source: WFL Lender Pool. Updated Weekly. Principals rounded to the nearest $1000. Relative interest rates listed below in order left to right. 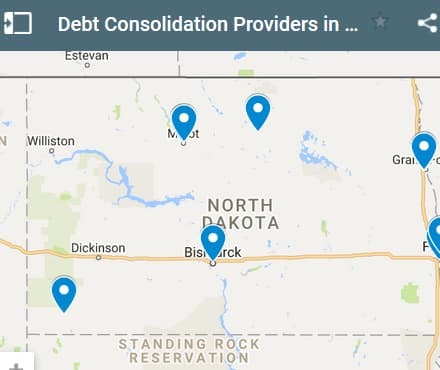 North Dakota residents have many choices when choosing a debt service provider. If they want help dealing with their debt they can use a credit counseling service, and depending on their debt they can apply with a local credit union or bank. If they need a debt settlement program they can use some of the companies listed here as well. If you have bad credit and your credit score is low enough that traditional banks won't approve you, you can use our pre-app system to access over 500+ lenders. Hundreds of these lenders will consider bad credit applicants for consolidation products, and dozens will approve loans based on your income from employment or whatever source your income is. Hildy believes that trouble always comes in threes and that seems to be what has happened to her in the past month. She is going to need a debt consolidation loan for $14500 which she wants to repay over the next six years. She really does not know what else to do at this point and just hopes that her problems are over. She ended up in emergency at the local hospital and after being there for only 4 hours the bill came to almost $9000 for treatment and testing. She is still fighting the amount, because it seems really high to her for what they did. Hildy is recovering and they did get her back on track. The day after she found out that her car needed major repairs and that these repairs were going to cost another couple of thousand. New tires, brakes, exhaust system and alignment all need to be done. She had no choice. The car was in for an oil change which was overdue and the mechanic said he could not let her drive on bald tires and squealing brakes. She also spent some money for household things before this all happened and now the credit card payment is due. She needs help to pay all of these bills, especially her car since she needs it to get back and forth to work. She is stressing out over everything and really needs to be approved for this loan. Hildy is fortunate that her credit score is in good shape and that she and her husband make sufficient money to allow her to carry the monthly payment for this loan. Everyone has to deal with financial surprises from time to time and sometimes they come all at the same time. Hildy is dealing with emergencies and also a short term cash flow problem, which this loan will solve for her. She and her husband have a small mortgage on their home, a car loan and the small amount of credit card debt previously mentioned. She might be able to obtain a smaller interest rate if she were to apply for a secured personal loan using her home as security. Since the home is in both her husband’s name and her own, they both would need to apply for the loan and be approved for the loan. They do not have a lot of time to make a decision. The credit card bill is due this week and she needs her car back to use to get to work. The hospital bill can wait a few weeks before it needs to be paid. They are reviewing their situation and will likely send it a revised application to show both names on the application. 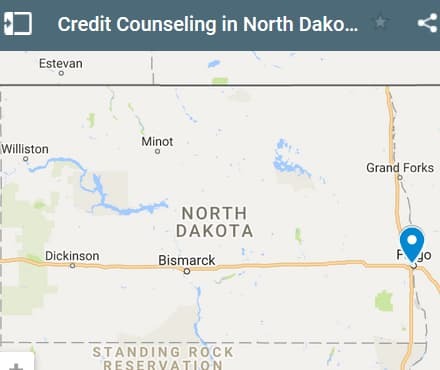 If you live in the State of North Dakota and you're trying to get approved for a debt consolidation loan, we hope our website helps you find a good lender regardless of your credit rating.